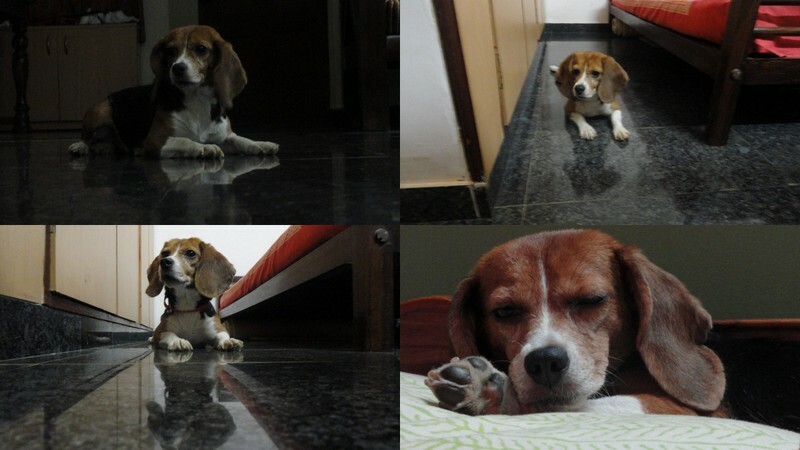 Hello all, I am a testing lab rescued beagle, my name is Mishka.. I think thats my name, yes. I am 4 years old and moved in with mummy, papa just 2 months back. So far I am loving them very very much. To be honest, I only took to liking them recently. For the first month, I was scared of this new house. There are hell lot of loud sounds here, it is hot as an oven and the other dog at home doesnt like me I think. I donno why, but I wont give up. I will continue enticing her till she becomes my friend. The old aunty at home, gives me curd everyday and so I like her too. Mummy, papa dint know how to take care of me initially, I had to take up the task of teaching them. Papa would put gun sounds on tv all the time, mummy used to cuddle me so much that I would choke sometimes, papa used to try feeding me all the food that I never liked(thou I had eaten nothing but pedigree all these years, but I wont tell him that, so that he tries hard to invent yummy food for me), mama used to make dynamite sounds at home by dropping things on the floor and hitting herself against walls and screaming(am I new here or is she?!). They spent hours experimenting on food to feed the finicky me and finally papa has found a good combination of meals, mummy also eventually learnt to boil eggs. She dropped a piece of a shell one day with the eggs(I am sure she dint do it on purpose) and I showed it to her so that she could be careful next time. Papa is very careless and doesnt open the door after food for me to go potty outside. He is still causing some accidents in the house. I think mummy has to train him! I have now taught them to cook, jump on bed like a dog and how to wake up people early mornings so that we can all play. Its been 2 months since we got little Mishka home.. The day we went to get her, there were so many other beagles in tiny cages that, to start off with, we dint know how to choose a dog. When we kept going from cage to cage, most dogs looked frightened, crouched up in their cages and afraid to even look out. But this little wonder, when we went up to her, she was all curious as to who we were, trying to smell us and wanting to come out of her cage. In a way when, she selected us. Since that day, she has kept us on our feet. For the first month, she was very scared of even the slightest of sounds as she wasnt exposed to any sound at all being locked up in an AC atmosphere all of her 4 years of life with no good human contact. She was undernourished and scared all the while, it took a lot of our energy and time in convincing her that we wont harm her. Mama had to shed some tears when she was rejecting any and all the food. Also, when we got her neutered, the very same day she was walking and trying to stay awake, being very insecure! Thinking about all that, today we are in a very nice place. She is pretty happy to be with us and jumps on us and wants to play all day 🙂 Though sometimes she just gazes into the sky and probably wonders how her friends are doing! Lab testing on animals is such cruely no? They have life too, they have feelings too. She was never tested on fortunately as they did not get permission to test on this batch of dogs as they had acquired this batch illegally. Inspite of that, the emotional trauma they undergo must be quite severe for her to have been so self aware and insecure all the while! Poor baby, whatever she has had to bear with in the past, all that is done with! She will only have lots and lots of love and pampering the rest of her life. who r u referring to as awesome babe, me or Mishka? come home sometime.. she is open for visitors! Pingback: Sakleshpur, May 2014 – this and that I fancy..
Pingback: My girl! – this and that I fancy..